to eye brows and other parts. She tried native treatment and other systems of medicine and local steroidal preparations also were tried to counter her complaints. There was some growth after Minoxidil application and injections, but vanished within a month. 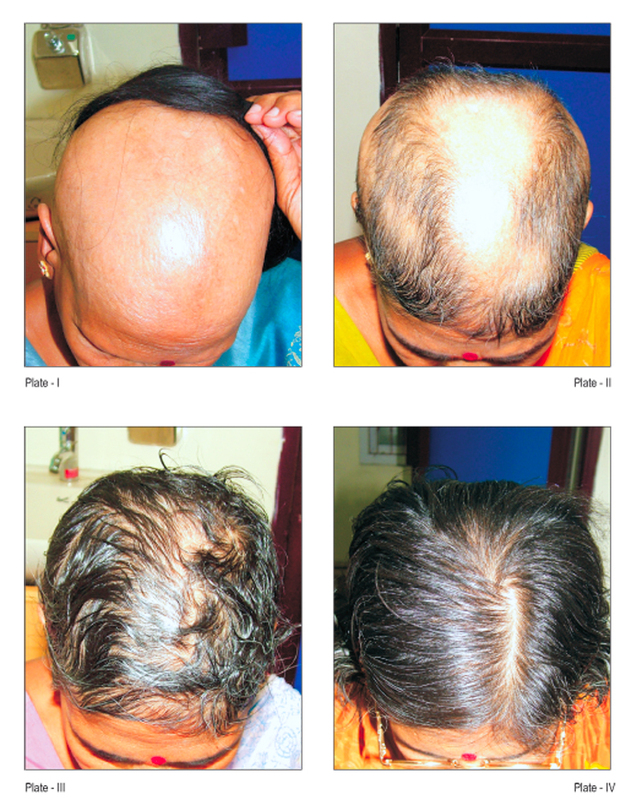 She was frustrated with the treatments and finally seeked homoeopathic help to restore her hair. The social embarrassment dragged her to cover her head with a wig. No itching reported or inflammatory signs traced from her past illness. She had tooth caries extracted two years back. She had ear discharge in child hood, stopped after treatment. No history of acute illnesses that complicated her hair loss pertaining to the complaint. No history of typhoid or jaundice. The blood parameters were within limits. She never had been reported as hypothyroid in the past. “Idiopathic" "Auto immune" are the suggested etiological findings that suggested as the causation for her complaints. She had constipation, hard stool that required great straining, Burning micturation occasionally. She was a tea tottler; a vegetation with desire for tea suggested be a cause.She was a retired teacher and her husband had and retired from government service. Among the two children, her daughter was married and lives happily at Chennai and her only son also married and lives happily at United states. Attained menopause, when she was 52 years old. She is cheerful, balanced with ups and downs in life. Stress part is less probed as a cause for her illness; of course she was embarrassed in wearing wig. On examination the scalp was very smooth, shiny; no hairs found arousing a suspicion that the damage could be deep seated, and also doubtful in successful treatment. Acidium Flouricum 1M Od for three days on empty stomach. Pl for fifteen days; Vinca Minor Q 15ml externally. The altered picture is presented by the patient with paucity of symptoms. She presented only the cellular pathology and it was not attributed with any sensations and there by no modalities on particulars. 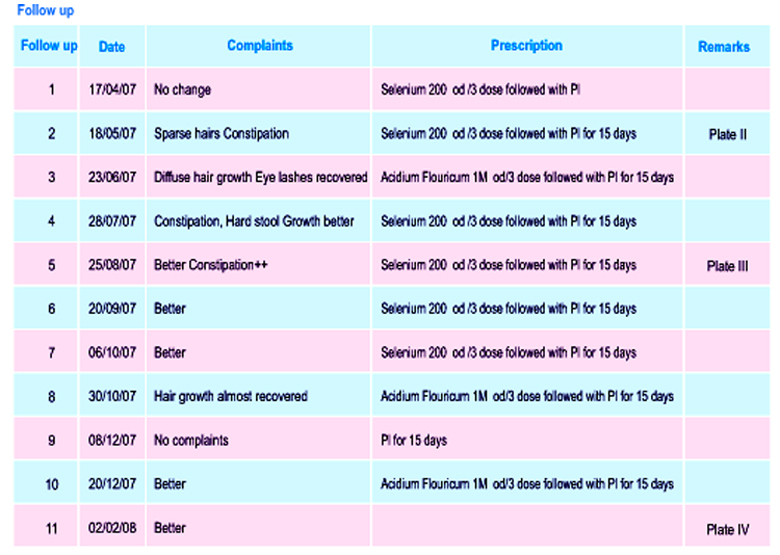 When the patient consulted me syphilitic Miasm was dominant, She was prescribed with Flouric Acid 1M miasmatically and sphere of action to uncover the surface miasm Selenium 200 was prescribed as a follow up remedy based on symptom picture.Here the action of follow up remedy is strong enough to bring the vitality back. The miasmatic remedy is repeated again to arouse and uncover the layer and complete the cure. Vinca minor Q was prescribed externally as an auxiliary treatment and convince the patient.